Italy – Central + Northern Italy – L’Italie divisée en ses différens Etats. Title-cartouche determined by puttos. 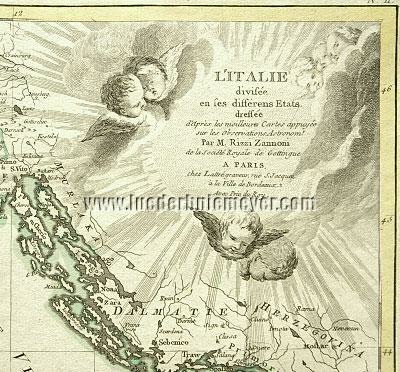 Detail map composed by Giovanni Antonio Rizzi-Zannoni (1736-1814) from Padua. Engraving colored in outline by Lattré in Paris. C. 1770. 12⅝ × 18⅛ in (32.1 × 46 cm). Typographic watermark. 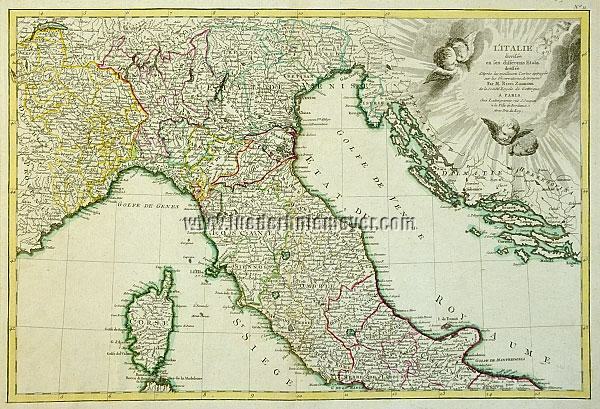 – Rizzi-Zannoni was Sicilian geographer and cartographer of the Republic of Venice, together member of the Royal Society of Sciences at Göttingen. Center: Republic of San Marino. – Limited on the line south of St. Tropez – Lake Geneva – Brixen – Dalmatia – Herzegovina – Bari – Gulf of Gaeta – Corsica .